Across from the dining Room is a pair of glass pocket doors opening into the gourmet kitchen (16' x 13'). 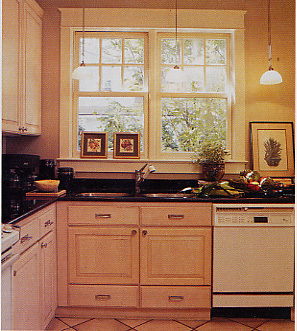 The cabinets are of bleached Maple and the custom designed and cut counter tops are of granite. At the end of the preparation counter is a circular granite eat-at counter. The cooking area also features a JehnAir downdraft grill, extra deep double bowl commercial grade stainless steel sinks and a microwave/ convection oven. Rotated 45 degrees from the back of the house is the sun-filled breakfast room (11'x 13')surrounded on three sides with windows providing views to the three distinct yet integrated landscaped areas. At the rear of the kitchen is a French door leading to the wood deck and stone patio. 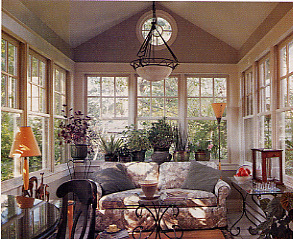 o Angled breakfast room/sun room facing 3 sections of landscaped gardens with over 27 feet of windows.